all the parts of the world today n everyday. & green with a blue chakra &wheel in between. white - peace & purity & green- faith & chivalry . Saffron flavored rice with carrot & peas . Happy Independence day to you too. Lovely rice. Happy Independence day. As usual very cute presentation. 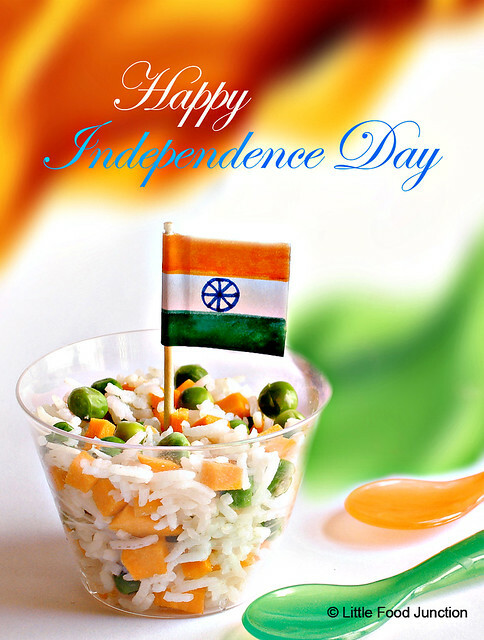 Happy Independence Day...... looks absolutely delicious and tempting.. Happy Independence Day !!! Super cool presentation!! Well, the dish has the exact same colors in it as your flag does, very clever! And I didn't know what your flag looks like before this, it is good to know!